A balance of art and science is the foundation for unique recipes. Welcome the fall season by trying the Evil Pumpkin Patch, which strikes a balance between locally sourced roasted pumpkin and a blend of spices. Unfiltered, unpasteurized ales are served at the peak of freshness directly from serving tanks. Savor the subtle, smoky taste of the Fox River Scotch Ale, with an overall low hops character to highlight the signature malt profile. A proud-to-be-local brewery that sources grain and hops from local vendors. Try the fall seasonal Last Cast – an IPA that blends bright, citrusy hops with bold flavors of the blood orange. (847) 428-4500, emmettsbrewingco.com Also in Palatine, Wheaton and Downers Grove. Traditional Belgian yeast strains, fresh-picked German hops and the finest British malts are globally sourced and locally brewed. Try the Munich Light Lager – a crisp and clean brew that’s light in body and low in hops bitterness. Respectful of pedigree, yet curious to experiment, this brewery balances classic and intriguing recipes. Sample the DuBelle brew, a Belgian beer with an appealing combination of orange peel, coriander and pepper ingredients. A quaint brewery that utilizes 100-percent natural ingredients. For a seasonal favorite, try the Fat Squirrel, made with six varieties of malt. The Midwest’s oldest brewery and second-oldest in the nation. Try the Lazy Mutt Chocolate Stout, with a roasted malt flavor, slightly sweet cocoa notes and a subtle hops bitterness. Focused on Belgian-inspired session ales, oak barrel-aging and alternative fermentation. Drink the Devoir Saison Ale with citrus yeast esters and a subdued earth tone. Rotating craft beers compliment the vegan pub fare. Order a pint of prunus – a bitter IPA brewed with peaches. A 15-barrel brewery is the backdrop to Rockford’s premier destination for handcrafted beer and food. Try the Petritz Pale Ale – expressive with flavor notes of lemon and bubblegum. Known for using local ingredients and producing whimsical flavors. Go for the Guildmeister – a German-style Kolsch brewed with the finest German malt and hops. Your friendly neighborhood “vardshus” (tavern in Swedish) serving cask-conditioned, unfiltered brews. Try the Viking Red Ale – an amber ale with flavors of creamy, sweet malt and a gentle hops finish. A pastoral palace that invites you to savor the sights, sounds and flavors of Italy, livened by a Midwestern pulse. A not-to-miss white wine is the Prairie Star, with delicate grass aromas and notes of tangerine. A family-owned and -operated winery that quenches the senses with luscious tastes, delectable aromas and a captivating setting. Try the DC Meritage – a blended dry red that leaves chocolate and coffee notes on the palate, with a long tannic finish. Cultivating new and distinct wine traditions through cold climate grapes, unique landscapes and Midwestern culture. The Fireside Red is a top pick – a port-style wine made from cold-climate varieties of Marquette and Frontenac, fortified with brandy. Specializing in creating handcrafted, award-winning wines from Illinois grapes. The 2013 Barrel Aged Estate Chardonnay is recommended for its soft whispers of fresh oak, lingering spice and hints of crisp apple. A family-owned winery that produces award-winning red, white and fruit wines. A top pick is the Illinois Marquette, a combination of a light Pinot Noir-style grape, cherry tannins and a little bit of soft oak. An upscale bed-and-breakfast set in a vine-covered building on a winery estate. Be sure to enjoy Lynford’s Oktoberfest wine, a 95 percent Riesling and 4 percent Chardonnay blend that mimics some of Germany’s best sweet, food-friendly white wine. Known for award-winning wines and breathtaking views of northwestern Illinois’ hill county. A bestseller is the Velvet Hour – a rich, smooth and dark fortified wine made from Frontenac grapes. A wide selection of wines made primarily from Wisconsin-grown grapes and fruit. For a fall favorite, try the Autumn Wine – a light-bodied apple wine that pairs excellently with pork dinner. Known for a philosophy of being good stewards of the land, the grape, the community and the consumer. The Chambourcin Reserve is a top pick; the 100-percent barrel-aged reserve uses the best grapes available from southern Illinois for a soft, rich finish. A unique attraction found in the Mississippi River bluffs region where Wisconsin, Illinois and Iowa come together. Sample the semi-sweet Pear Tree Blush, named for the vineyard’s own pear tree that’s been lending flavor to nearby grapes for 75 years. Local and West Coast grapes are crushed, pressed, fermented and blended in small batches to become artisanal wines. A favorite is the AXL semi-sweet rose, with luscious flavors of pomegranate, sugared strawberries and a touch of tart sweetness. 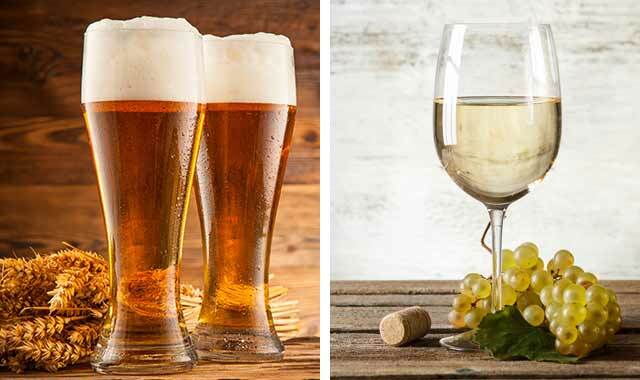 Chicagoland’s only winery, brewery and restaurant has a casual dining atmosphere with an elegant selection of food, handcrafted wine and handcrafted house brews. Enjoy the newly released 2014 Pinot Noir Reserve that’s deep garnet in color with aromas of cherries, plum and raspberry. This entry was posted on Monday, October 10th, 2016 at 12:00 pm	and is filed under Dining Guide, Top Posts. You can follow any responses to this entry through the RSS 2.0 feed. Both comments and pings are currently closed.